As mentioned in my previous post I stopped by my local LOFT yesterday. I was anticipating a change in the LOFT sale and the sale opened up to everyone at 5PM ET Sunday night. 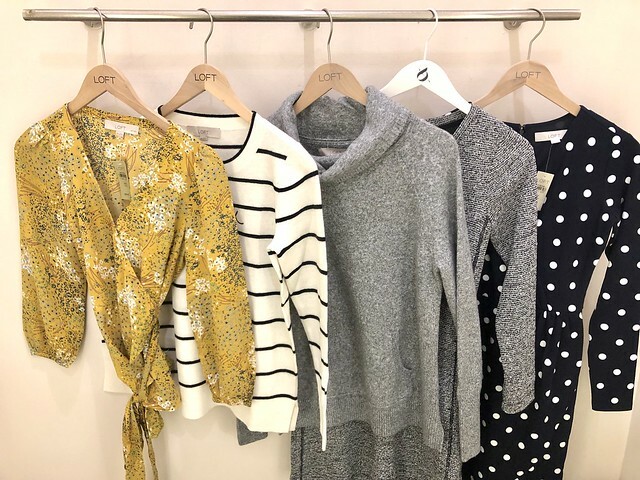 Get 40% off full-price styles and save an extra 50% off sale styles at LOFT. Sale ends 1/15 at 3AM ET. Since no code is needed use APR441LC for $25 off your full-price promotional purchase of $75+ (click here for the in store bar code). This code excludes Lou & Grey and clearance styles. Some sale styles are even $15 and under. Update 1/16 12AM ET: Get 50% off your purchase at LOFT using the code WANT. thought it would but better late than never, am I right? In case you missed the announcement via email, LOVELOFT cardmembers enjoy an extra 15% off at checkout every Tuesday in this month (no code needed). Usually the cardmember discount is only honored on the first Tuesday of the month. This offer is combinable with other promotions since the discount is reflected automatically at checkout. If you’re a cardmember and you don’t see the extra savings on the order summary page I recommend deleting and re-entering your credit card info. Hopefully the current sale will be extended through tomorrow for extra savings if you’re waiting to purchase in order to maximize your savings as a cardmember. I’m holding off on placing my order. Not to get anyone’s hopes up but last year LOFT did a flash sale last January 21018 so I have more than one reason to wait until tomorrow rolls around. For size reference I’m 5′ 2.5″, I weigh 108-110 pounds. I’m usually size XS petite in tops and 0/25 petite in pants and jeans if an item runs true to LOFT sizing. I share links to a short video clip below each image (the same video clips I share in my Instagram stories swipe ups). My reviews and outfits are also Pinterest for those of you that prefer a more organized, visual catalog. 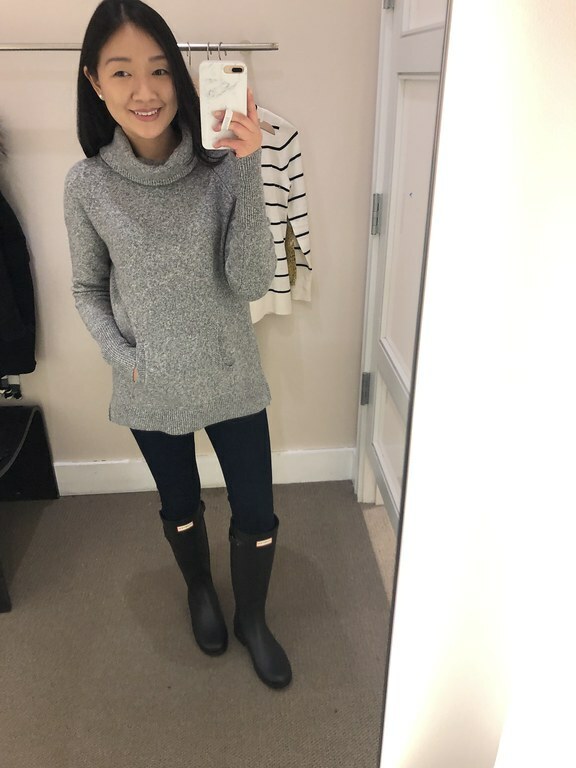 I previously reviewed this sweater in the sky blue color here and I saw the grey color and I tried it on in XS regular. I actually prefer the oversized fit of going up one size from my usual. 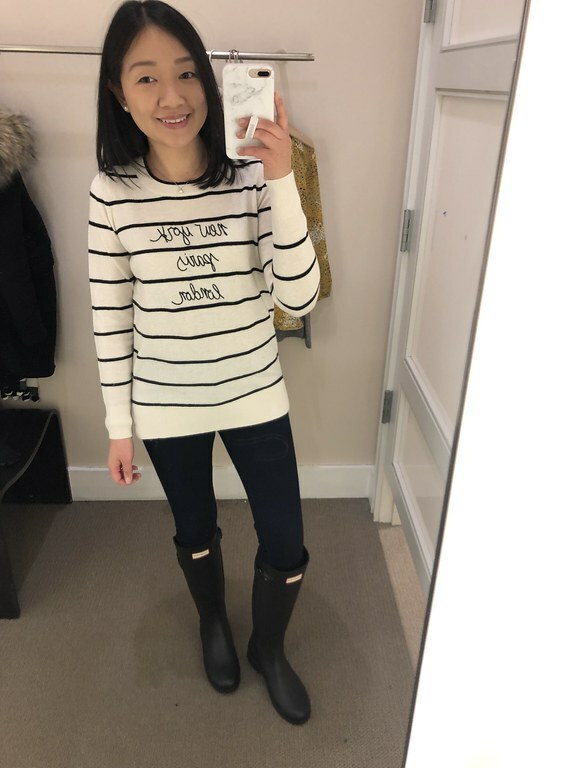 I was curious about this striped sweater since I like the cursive lettering. I tried on size XS regular which is a relaxed fit on me and it covers my front and backside nicely. Sizing down to my usual size would be too close fitting at the hips for my preference. I passed on the sweater since I didn’t love it on me but it looks so cute on others. It’s not too thin so it isn’t see through. 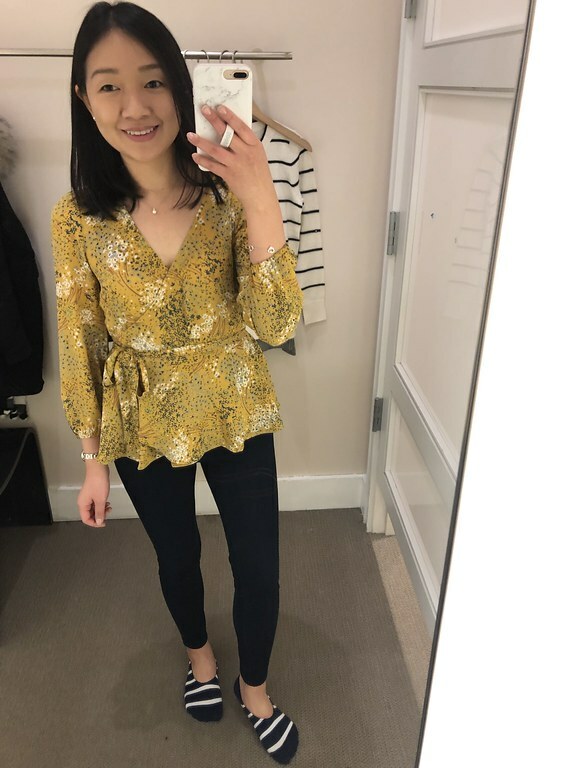 This marigold floral print is very pretty (this daisy print is cute too) and I tried on my usual size XSP which fits true to size. The wrap top even has a hidden snap button to keep the top portion more secure to prevent wardrobe malfunctions. I hope this thoughtful little feature is something LOFT will include in their other wrap tops and wrap dresses in the future.The belt sash ties very high (a few inches above my belly button). I ordered size XXS regular in case the extra length makes a difference. If you like this print it’s also available as a sleeveless shell and dress. I tried on this wrap dress in my usual size 0P. It fits just like the hunter green one from the fall (review and measurements here). The front wrap portion is more open so you may want to invest in some fashion tape or sew a hidden snap button to make it more secure. To be honest I regret getting the hunter green dress because I haven’t even worn the dress yet. I tried it on during Christmas day but I ended up wearing something else after fussing with the fashion tape. 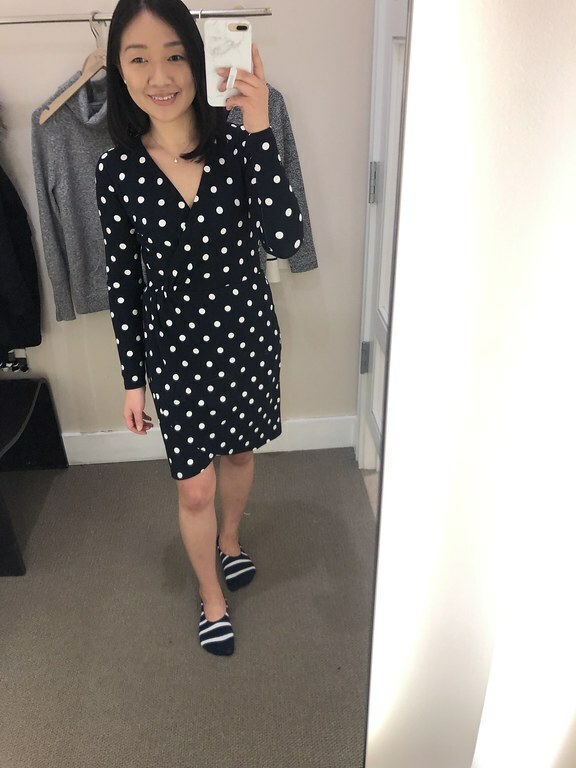 The waist isn’t flattering on my figure and I felt wide in the green dress but the navy color and white polka dots print appears slightly more flattering and slimming. For now I passed on this dress since I haven’t even worn the dress I do have. 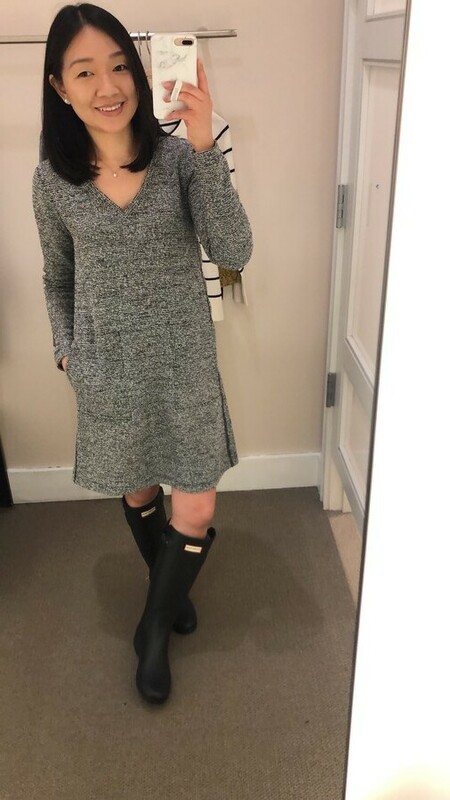 I saw this dress featured on @loveloft_ithaca and I had to find it to try it on. It’s a well made, comfy dress with pockets and it’s a modest length on me. Unfortunately my usual size XXS regular is too loose all over as seen here and here. I recommend going down one size for this dress and I really wish this dress was offered in petites. Refer to all of my previous LOFT reviews here. Thanks Jenna! I was just wearing that sweater yesterday after getting it in the mail. Apologies for the late reply. At this point I am running out of hope they'll do a flash sale with free shipping this month but that's what I'm hoping for at 5PM ET tonight. My last two orders were a fail fit/sizing wise. Thanks Young! It will look amazing on you! I'm trying to only get things in one color this year but we'll see how that goes… I used to get multiple colors in the past but I'd only end up wearing my favorite color all of the time.